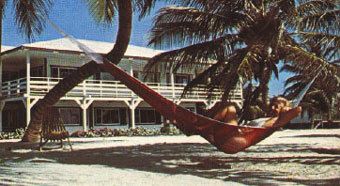 El Pescador marks its beginnings as an undeveloped beachfront owned by a Dr. Curran of California. The land was purchased sight-unseen in 1972 by Juergen and Kathleen Krueger from an aerial photograph of the island. As Juergen Krueger was forming plans for the lodge design, he developed a rapport with the local Mennonites due to his ability to speak their Platt Deutsch language. Krueger negotiated with the Mennonites for the best lumber for the construction of the lodge. In May of 1973, a barge arrived with the lumber to begin construction. Krueger obviously got what he was looking for. To everyone’s amazement, the hardwood was so dense it sunk as it was off-loaded from a barge at the beach and a human chain was necessary to complete the task of getting it onshore. On September 4th 1974, the first guests checked into the newly finished main lodge (today this is rooms #1–10). The two parties checking in had arrived on the same flight and there was nearly an argument over who got to sign the guest register first. 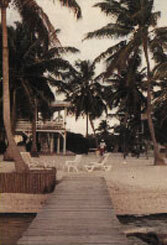 1997, the world-renowned fishing lodge was purchased by brother and sister, Logan and Ali Gentry, after Logan had enjoyed the flats fishing vacation of a lifetime as a guest of El Pescador. They ran the lodge together for five years enjoying many adventures. Logan passed away in a boating accident in May 2002; we miss him every day. El Pescador continues to be a testament to his entrepreneurship, the joy of life, nurturing of friendships, love of sport fishing and stewardship of nature. In 2004 Ali’s parents, Chris and Steve Spiro, joined her in Belize to take over the operations of El Pescador so Ali could spend more time with her three wonderful daughters, enjoying the gift of raising them in such a unique paradise. In 2015, Chris, Steve, Ali and her daughters moved to Richmond, VA to continue the girls’ education. A General Managing couple has taken over the day to day responsibilities of managing the lodge from Steve and Chris. They handle all of the daily operations of the lodge and assist our staff, guides, and guests with everything that makes a trip to our island a unique and memorable experience. Ali commutes back home to Belize frequently and continues to lead El Pescador.